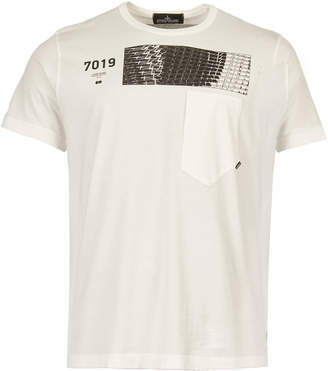 Stone Island Shadow Project T-Shirt in White. The staple white cotton crew neck has been given a graphic takeover by Stone Island's Shadow Project team. The geometric style print sits above a unique shaped patch pocket. The back of the t-shirt features a similar print, in a triptych style block. The t-shirt is finished with a subtle logo tag to the seam of the pocket.